Sovereign Cast Iron Radiators are cast in Europe and assembled in the UK. 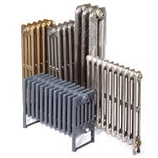 These beautiful and traditional cast iron radiators have a 25 year guarantee reflecting the quality. Each Sovereign cast iron radiator is available either in primer, painted, polished or in a range of traditional antiqued finishes.